Hey Guy's and Gal's, as much as I eat, sleep and live for makeup can you believe I have never tried NARS makeup!! Today I went to my local Selfridge's store and headed straight to the NARS counter. O.M.G why have I only just discovered this makeup brand, as soon as I walked in I was fascinated by all the beautiful colours, the way how the ladies working in there left me to browse and as soon as I looked confused they came over and asked if I needed any help :) perfect! Because it was my first time buying NARS I decided that I was only going to buy something small, so I chose " Perfect Match Lip Gloss " in the shade '' Angelika '' which leaves your lips a cotton candy colour, sparkling silver and gold. 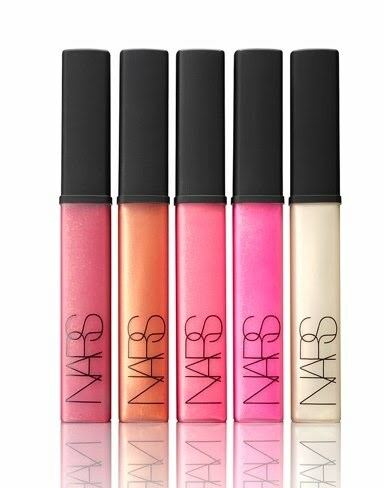 I usually always wear a lipstick underneath a lipgloss because I think that lipgloss has a extremely thin texture, I was so surprised with NARS that this lipgloss looked perfect without needing to put lipstick underneath RESULT! I am so impressed with my beauty buy you guys definitely need to purchase this product. This lipgloss even has the matching blusher :D may I just add that these lipgloss's are Limited edition so unfortunately they will not be around forever, that's even more of a reason for you to go on a beauty splurge. This lipgloss is available to buy from your local selfridges store at £17.50 or you can purchase it from the NARS website.